n.p., [196-]. 8p., 8.5x11 inch sheets stapled together at upper left. 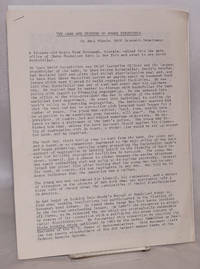 Anonymously produced version of this much-reprinted text. Gives examples of corporate campaigns in the civil rights movement in Georgia and Birmingham, Alabama. Minnis was the research director of SNCC.